The submission of the Vice-President, Administration to the CRTC does not represent an official position or the totality of opinions at Brock University. So how did the Vice-President, Academic come to submit to the CRTC and who did he consult? Given the role Bell played in the FairPlay coalition, it will not surprise to find that Bell Media was behind lobbying for the letter. According to documents obtained under provincial access to information laws, Mark Milliere, TSN’s Senior Vice President and General Manager (part of Bell Media) connected with Hutchings in early March with the assistance of Ryerson University professor Cheri Bradish, a former Brock professor. Milliere attached a letter of support filed from Ryerson University and asked that a copy of the Brock letter on Brock letterhead be provided to Bell. 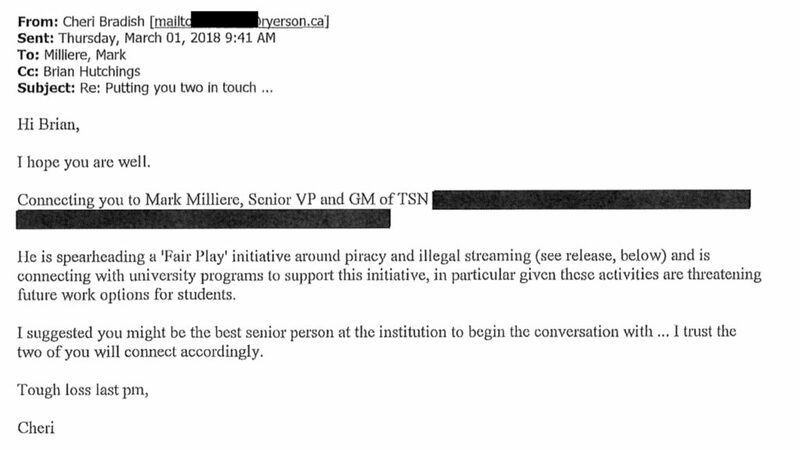 The request points to a clear Bell strategy of obtaining support letters to shop around to other potential targets as the Ryerson letter was not public at the time and only filed nearly a week after the Hutchings letter. On March 22nd, Milliere followed up with another email, asking whether Brock was able to write a support letter and inaccurately stating that the deadline for submissions was the next day. Given its other astroturfing efforts with its own employees, the Bell backroom pressure on universities is not particularly surprising. However, the documents confirm that the source of the largely discredited submission was Bell outreach (notably, Bell’s contacts at Brock were so limited that introductions from another university were needed). Further, had Bell not given a false deadline date to spur action (the original Bell letter included the correct submission deadline), it is entirely possible that the submission would have come on the final day, thereby eliminating the opportunity for other Brock executives and faculty to correct the public record. The pressure at Brock was presumably mirrored at other organizations, confirming yet again the the FairPlay “coalition” was a Bell-led initiative and raising the question of which supportive interventions were the direct result of Bell outreach to business partners, grant recipients, or others beholden to Canada’s largest communications company. Making a mountain out of a molehill. Anytime you see a MeToo petition or a joint statement condemning some government policy or another there were people behind the scenes lining up support. I loathe Bell. But Bell is right: they employ university grads. The knee-jerk reaction from the “Brock community” is the usual mushy liberalism from people whose livelihoods aren’t at risk from piracy and who are happy with the solutions offered by Michael Geist and the Canadian government: litigate your woes. Litigation is expensive and out of the reach of anyone but Bell. Government regulations exist in all sorts of fields precisely so not every member of civil society has to litigate every difference with every other member of civil society. It is entirely reasonable, in today’s day and age of rampant piracy by people beyond the reach of a normal citizen (expensive litigation, difficulty in identifying and finding the pirates) that regulation of the Internet include the possibility of blocking access to criminal sites. Tour municipality makes you get a dog licence, but anyone can set up a pirate site. George Bell – here’s a memo for you: everyone employs university grads. Your post is sadly reflective of the quality and substance of Bell’s “initiative” and your pouting of “leftie liberalists” is sadly the often repeated knee-jerk reaction whenever anyone disagrees with a self-serving corporatist agenda and has become more than tiresome. Funny, most citizens would be opposed to a store setting up to sell unapproved by Health Canada prescription medications from China without a prescription, precisely, and would want the store shut down. Post my work on a Chinese pirate site, ohhh, that’s freedom of expression, ohhh, you have to be a corporate hack to want to interfere with free enterprise like that, go sue the Chinese pirates if you like, but don’t touch my civil liberties. Why can’t I have the civil liberty of walking into a store and buying Chinese medications without a prescription and without them being cleared for import and sale? No they don’t. They send a letter saying that the person/company is not in compliance and if they don’t comply they will be prosecuted. That’s Health Canada making an administrative evaluation of whether the person or company in question is in compliance. If you get a letter like that and you believe they are in the wrong, you launch an administrative appeal. It all takes place outside the courts, until you get someone who openly defies an administrative order and keeps on doing what they’re doing. Just like a pirate site under the blocking proposal. If you’re not doing anything wrong, you appeal and present your evidence. To a CRTC panel. But sure, eventually, if all other avenues fail, Health Canada will turn to the criminal justice system. And what that means in practice is that they or the police at their request raid your premises, charge you under the relevant Act or the Criminal Code ad SEIZE YOUR ILLICIT GOODS as evidence at trial. If you believe they aren’t illicit, you have to go to trial with your witnesses and your lab tests and whatever and prove it’s just sugar and water and not what they say it is. Well, a pirate’s stock in trade is digital files, generally stored on an offshore server. They can’t be seized for two reasons: there is not a limited number of physical copies to seize, and they’re not on Canadian territory. So obviously you shut down the site in lieu of seizing the contraband, and let the pirate appeal. I can see all the world’s torrent site owners lining up to appeal, I really can. Total Health Centre in Williams Lake [B.C.] was the scene of a raid Feb. 22 , where several products, including unauthorized prescription drugs were seized. According to Health Canada, the products seized included progesterone creams, thyroid and L-dopa capsules and high-dose vitamin D products. Consumers are warned to not use these products. Health Canada said they were informed of an issue by the College of Physicians and Surgeons of British Columbia, and seized injectable products and unauthorized prescription drugs from the centre. George: I consider myself a little more tech savvy than your usual member of the normal citizenry but I am by no means knowledgeable enough to set up a ‘pirate’ site as you claim. I do not see ‘today’s day and age of rampant piracy’ and honestly, wouldn’t know where to go if I were to try and search out that pirated content. Now, that being said, I don’t think piracy is the important part of this story. It’s the strong arm tactics by a member of the technology industry to support their goals. I would expect this of a totalitarian regime but Canada? No. It’s wrong. Plain and simple. You’re tech savvy but don’t know how to find pirated content? I applaud you, but you are part of a minority. Every grad student in the country knows how to find pirated books. Huge numbers of film buffs and music fans know how to find pirated books and movies. Novelists report that their books are on dozens of sites the moment they are released. I think your rhetoric is a little overblown. Totalitarian to ask an institution to sign a petition asking for new federal regulations around a criminal act? I think you need to visit a totalitarian country for a little perspective. I told you, I hate Bell. I expect to hate Bell. What really bothers me, if you’d like to know, are professors of law with cushy public jobs pushing an agenda, in the most intellectually dishonest manner possible, that means wiping out the livelihood of individual Canadian creators. With respect to a neighbouring post on this site and my comments on it, why does Doctor Geist report inane stories like “scientific journal publisher reports no lost income from piracy,” but would never dare make the same claim about publishers of novels, for example, while at the same time never acknowledging that the situation there is different from that of the cases he likes to report. And you’re taking my claim that “anyone can set up a pirate site” a little too literally. Yes, a small group of people, or one person for that matter, can easily set up a music or movie torrent site for others to contribute files to and “share.” What.cd, the Pirate Bay, and many others. They’re pretty low tech, actually, and all kinds of people – millions – have figured how to upload to and download from them. Books are even easier and take less server space. Go to bookzz or lib.gen or aaaaarg.fail and have a look. So the fact that you “don’t know how to set up a pirate site” is a little irrelevant, given that there are hundreds of them out there – *someone* knows how to set them up, and I don’t think they’re NASA scientists. I’d be “blocked” if I tried to sell real estate without a licence, but running a pirate site is OK. How is blocking the site “problematic” (leave aside ISP data, that’s not being discussed here). Bell is wrong on the merits of its argument and wrong on the tactics. Dr. Geist has documented the actual low amount of piracy in Canada, and how Canadian anti-piracy and anti-[counterfeiting laws are among the strongest and toughest in the world. As for Bell, its tactics in rounding up academic support for its untenable and easily-disproven arguments would not be so abhorrent if it were not pretending to hide behind an astroturf body. Bell’s actions are as repugnant as when, in the U.S., opponents of the Affordable Care Act hid behind astroturf groups claiming Obamacare would create “death panels” to get rid of elderly people who were sick and dying, and denying them access to health care. Bell should focus on delivering telecommunications at a fair price with customer service that wasn’t easily confused for an oxymoron. He’s documented low rates of piracy in Canada? Nonsense. Piracy is rampant the world over. And as I’ve stated repeatedly, a law is pointless if it is not enforced by the criminal justice system (and it’s not) and the contravention is too expensive too pursue through the civil justice system (and it is). And yes, I abandoned Bell long ago. Horrible service. I have mega corporations. Although the small players in the field are no better. It’s a generalized state of taking the consumer for a ride because you can. If someone knows a Canadian telecom worth giving my business to, please let me know. Otherwise they’re like banks: very few and all bad. typo: I hate mega corporations. And the analogy withe Obamacare fight is specious. In one case the claims were specious and outright lies. In the other case, site blocking, either side can be argued on its merits. You people always argue your points with supposedly self-evident truths that aren’t. But how do you feel about mega corporations @George? The Real Estate Council of Alberta (RECA) has issued a consumer alert, accusing a Calgary man of dealing in real estate without a proper licence. RECA claims Derek Johnson, also known as John Davis, preys on home owners in financial difficulty that are facing foreclosure. The Council says Johnson is currently operating under the name “Joe Rheal Estate” with the website http://www.joerhealestate.com. “The Real Estate Council of Alberta has issued a direction to Johnson to cease unlicensed practice,” according to a news release issued Thursday. more specious arguments: not REMAX, but a “Real Estate Council” with authority to regulate its industry. Like the CRTC, not Bell. You can only argue by muddying the waters and slipping in outright lies.